Welcome to ATMA-UG - Online portal for Integrated MBA, BBA, BBM, BMS, BCom, BCA, BSc (IT) and similar ones admissions entrance tests. 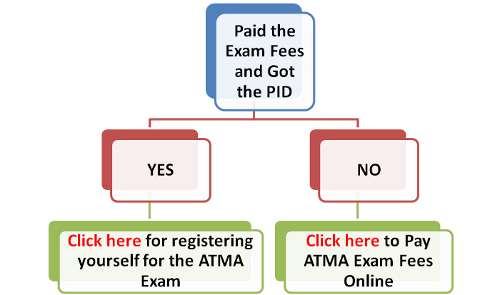 The registration process for ATMA-UG Exam starts with the Payment of Fees. The Registration Fee for ATMA-UG exam is of ₹630/- (Rupees Six Hundred thirty Only). The exam fee can be paid using Debit or Credit Card only. Facility for payment of fee in Cash / DD / Cheque / Internet Banking is not available. Once the payment of Fee is successful and the PID is received, the candidate can proceed to fill the registration form by Clicking Here. Following information is required to be filled in the registration form. PID, Name (You need to click FETCH NAME Button to fetch the Name from the database. ), Postal Address, Email Id, Date of Birth, Mobile Number, Preferred Test City Choice, Educational Qualifications, Exact Percentage of SSC, HSC, Degree (In case the candidate is appearing, mention "NA") Post graduation/Professional Degree if applicable, Post qualification experience, if any, and choice of Institutes for reporting ATMA-UG Scores. Once the registration is complete, candidate can proceed for Printing of Admit Card. However, Admit card can be printed on 02 May 2019 Onwards Click Here. Female Candidates: I am a female. If my statement is found to be incorrect at the time of verification, I agree that my admit card shall not be generated. North Eastern Candidates: I am a candidate from North Eastern State (Arunachal Pradesh, Assam, Manipur, Meghalaya, Mizoram, Nagaland, Sikkim and Tripura). If my statement is found to be incorrect at the time of verification, I agree that my admit card shall not be generated. Subject to the above declaration, the fee payment is allowed now. On wrong declarations, the Secretariat shall not entertain any correspondence.